Like her jewelry, Cathy Waterman's tabletop designs are inspired by nature. The collection, which she has been working on for two years, is available at Barneys. Candle Holders Waterman's whimsical sterling silver candle holders are handmade and take their shapes from flowers and trees. "These are special things to get, when you're starting a life with someone. Sometimes you receive them as gifts, or you might be lucky enough to inherit silver." Made to order from $5,190 per pair. Dinnerware "I'm crazy about this shade of yellow; it's similar to my favorite pair of leather chairs." The porcelain collection, which is made in France by Bernardaud, includes Waterman's signature wreath-like logo in gold. Plates from $180. 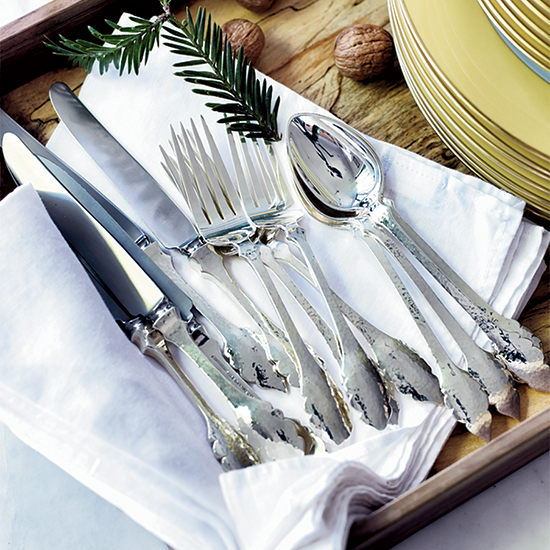 Silverware The ornate handles of the sterling silver Guinevere flatware resemble arched windows from medieval architecture. The flatware is hand-forged in Massachusetts at one of the country's two remaining foundries. "I like American work," she says, "but it's hard to find people who still craft silver." The price is high, she realizes, though "it's not every day that you buy sterling flatware. It was a big deal in my house when we first got some. I saved for 15 years to buy it." $3,760 for a five-piece setting.